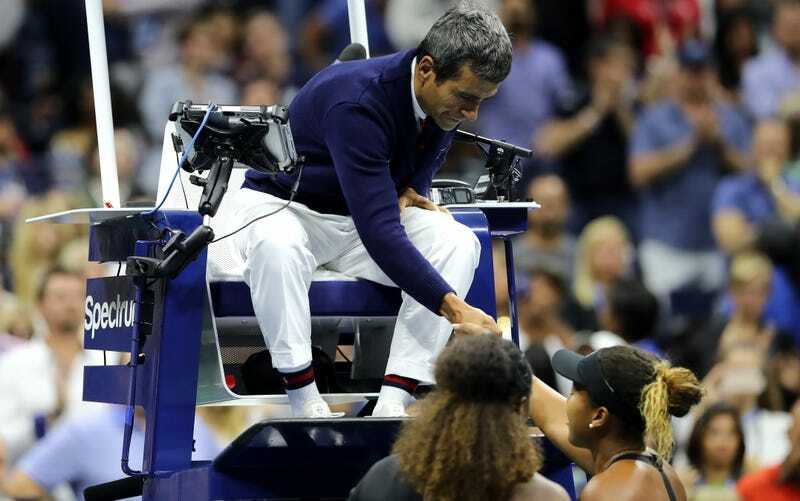 The Times of London reported Tuesday that some anonymous tennis umpires had considered boycotting Serena Williams’s matches after her spat with umpire Carlos Ramos derailed her U.S. Open final against Naomi Osaka. As this story has been picked up, shorn of context, and redeployed in unfamiliar contexts and epochal culture wars by racists and rule absolutists and well-meaning people missing the point, umpires have frequently been cast as the antagonists. It’s easy to see why the story plays out this way: given all the obstacles tennis has placed in Serena Williams’s path, her conquest of them should be read as triumph. And it’s easy to lump in Carlos Ramos as just one more person obstructing her path. But one aspect lost in the easy analysis is that despite their on-court power, umpires are labor too. It’s not clear that Serena’s identity is relevant to this grievance—except in the sense that she is one of a handful of tennis players powerful and popular enough to elicit this kind of trembling, mealy-mouthed response from up above. The umpires could hardly be blamed for wanting some cover in those situations. This hypothetical boycott is far from a clean solution and is even, on its face, ugly in its specificity, but attributing it solely to racism is reductive. When, say, Novak Djokovic puts on a fit in front of Ramos, as he has in fact done, he’s going to get a violation, and unless he explicitly ties that treatment to, let’s say, anti-Serb sentiment, there’s no reason for the ATP or USTA to say or do anything but stand by its umpire. Serena Williams has both the influence and the difficult history of playing her sport in an often hostile environment. Even after this incident—one that’s less easily explained by structural bias than by the fact that a star knowingly pressed up against the limits of what the sport allows, while a universally stringent umpire opted to use a heavy hand—she is still an avatar for much larger principles, for reasons both in and out of her control. It is possible to believe all of the following: that the tennis bureaucracy—including its umpires—has made Williams’s career much harder than it ever needed to be, that this has been shaped by systemic racism and sexism, and that this very same bureaucracy can just hurl an umpire by the wayside when it is convenient to do so. Even veterans like Ramos are not in such a great situation, structurally speaking, when they find themselves on the receiving end of an influential player’s meltdown. For his part, Ramos seems to be perfectly okay: “I’m fine, given the circumstances,” he told the Portuguese newspaper Tribuna Expresso on Tuesday. He will resume his duties as usual when he officiates this weekend’s Davis Cup tie between Croatia and the United States.